Herb gardens are defined not by thei r organization but by the plants grown in them. If an herb is a plant with a use as a seasoning, fragrance, dye, fiber, or medicine, then an herb garden is a garden of useful plants. The current definition of herb garden has become a little vague. Most herb gardens are made in the tradition of old school squares or rectangles, divided in to smaller squares to make tending the gardens easy and less labor-intensive. There is no real set rules for herb garden design and they are mostly left to the imagination of the person planting them. How can we distinguish an herb garden with a mixture of perennials and ornamental annuals from a perennial garden or a mixed border that includes a large number of herbs? Maybe the proportion of useful herbs to ornamentals doesn't matter. Maybe the important thing is to keep growing herbs and create our own place in a long tradition. Typically, herbs used regularly for such things as cooking were placed in the herb garden design close to the door for easy pickings. They also considered the nature of the plants and their use, with such considerations of annual, biennial or continuous growing. By their herb garden design they could keep fresh herbs constantly growing and have easy access to the ones used the most. Additionally, decorative plants were included in the garden to make it aesthetically appealing, a tradition continued with many gardens today. Practical as well as ornamental, formal herb gardens laid out in simple beds date back to medieval Europe and continue to be popular today, as this contemporary take on a 12th-century garden attests. Although most modern herb gardens share the theory from the monks of old who made their herb garden design with the use of the plants in mind. Large formal herb gardens were the domain of monasteries, manor houses, and palaces. Simpler households grew useful plants in unstructured dooryard plantings, where they would be close at hand when needed for cooking and other purposes. When thinking about your herb garden design , the first thing to look at is the area in which it will be located. It should have exposure to full sun for four to six hours every day. Many herbs may grow better with more sunshine and others with less, but as a basic rule of thumb, it will allow most herbs to grow appropriately. 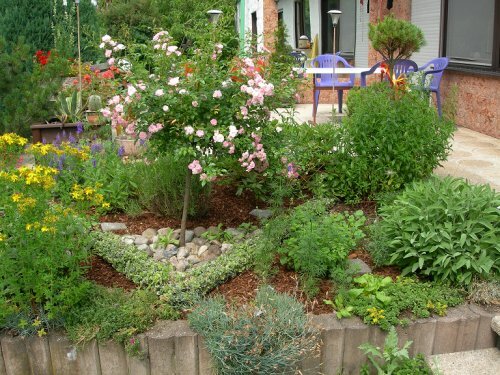 In many examples an herb garden can be designed to fit into the existing landscape design. It can be at ground level with a small wood frame surrounding it to completely separate it from the remainder of the yard. Additionally, the herb garden design can be raised by building a frame out of large timbers, such as railroad ties filled with dirt. Small steps leading to the upper level may be needed to walk on the pathways included in its design. Smaller herb garden design kits are available to grow spice herbs indoors or on a patio for those living in apartments without the benefit of access to a larger yard. For others, there are a choice of herbs that can be included. Spices for seasoning, dyes, medicinal uses and fiber can be planted in an herb garden. Once the basic design has been determined, the choice of plants and their relative position in the garden needs consideration. Make sure there is room to maneuver when weeding or gathering spices from the garden. Regardless of its size and use the herb garden design should make working in it easy on the grower. Lately gardeners have become more and more engrossed in the ornamental qualities of the herb garden. In the last 20 years the plant list has significantly expanded as new color forms and cultivars of herbs long grown for their usefulness have been developed. This trend may be the logical outcome of the ornamental herb garden's evolution as a distinct garden type. Many foliage plants that are regarded as herb-like in texture, form, or fragrance are now admitted to the herb garden. Experiments with color in the herb garden have also encouraged the inclusion of many purely ornamental flowering plants. At the same time, plants appreciated for their medicinal or other uses continue to find new homes among more traditional garden herbs.